Sometimes Christmas shopping can be an absolute joy. You go out, list in hand, and shop your little socks off. Returning home that day with all your gifts condensed down into two or three shopping bags. However, sometimes this doesn’t quite work out the way we expect. One Christmas tradition we have among our friends is going to our local pub on Christmas Eve for a meal and a mingle. This is such a lovely thing to do as it allows us to see everyone so close to Christmas that the following days can be spent quietly with family, eliminating the need for dashing around to give out gifts, etc. The only issue with this approach is that, at its peak, we had close to 40 people (!) showing up to this Christmas Eve shindig. And although not everyone was a close enough friend to receive a big gift, it still felt a tad grinchy not to give out some little Christmas token gestures. As you can imagine, this got pricy! I came up with some ways of dealing with this high volume of gift giving. So whether you have 5 or fifty people to buy for, these tips should help anyone out! Set yourself a budget that you can actually afford. Work out how much you can realistically spend per head and go from there. If your budget only stretches to a small amount per person you may have to have a rethink and try a different approach (see ‘Secret Santa’ below). After all, you want to be getting people gifts that are worthwhile and they will enjoy, not some naff token that they don’t really want or need. It always seems like a great idea to handmake gifts to save on cost and make an impressive statement. Think carefully about this before you begin and remember to factor in the cost of each part you will need to buy. Whether this is ingredients, knitting supplies, those little plastic gift bags to present them in, or even your own time. It all adds up. Stick to simple and effective. Buy multipacks of items you can split up. Eg. a set of liquid lipsticks can be split up into separate gifts (tailor the different shades to the right people for extra brownie points!) Or the sets of alcohol miniatures that supermarkets sell at this time of year, they can be broken down too. Especially when giving edible gifts, this is a fantastic method you can utilise to save money and make an impressive gift for all! This is my FAVE way to make an impressive gift out of not a lot. Using the Batch buy tip above, scour the shops for multipacks of goodies that you can break up and pop into some lovely little gift bags. Your friends will love the little parcels as each one will be slightly different. You can also make this one quite impressive by including some branded items to add the luxury feel! Up the ante by blind wrapping all of your finds and get your friends to choose one at random from a Christmas stocking or Santa sack. Fun for everyone! If budgets are really tight (and let’s face it, who doesn’t want to save some money at this time of year) consider hosting a Secret Santa. Get everyone who wants to take part to submit their name to a random draw. This can be done in person with names out of a hat, or there are many websites that can do this for you. Some even send you email reminders and allow you to set wishlists! This way, you only have to buy for one person instead of potentially hundreds. (Ok slight exaggeration. But it does feel this way some times!) You can spend a decent amount of money and really find something thoughtful for your recipient, and hopefully receive something lovely in return from your secret Santa! 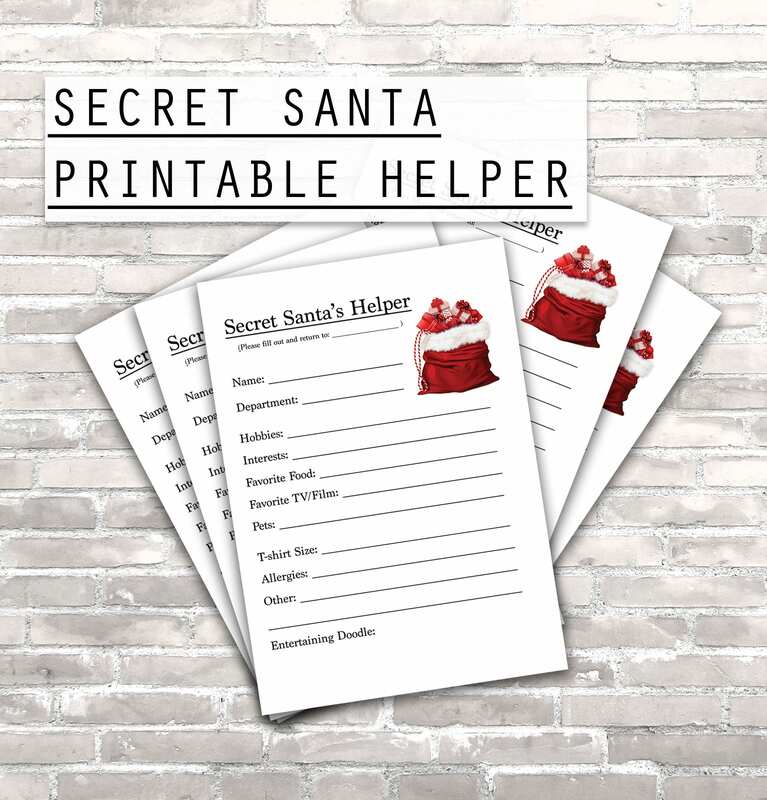 I’ve actually made a Secret Santa helper to download and print. It’s available in my Etsy shop. This should be filled out by each participant and then serves the dual purpose of the name draw cards and the wishlist! It’s usually £4 to buy the instant download, but if you are reading this and fancy it, click here to get 85% off this price. Here are some specific ideas with the above tips in mind, to get your imaginations flowing! This is incredibly easy and an excellent way to make large batches quickly. Experiment with different flavourings for an added Christmas twist. My Orange and Amaretto ones went down very well indeed! Raid Primark! Lipbalms, makeup sponges, room sprays, Christmas socks, press-on nails make for an impressive (yet budget-friendly) beauty box! On a very tight budget? Bring one large cake or festive bake and party bags. People will not care about receiving a “real” gift if they have a slice of cake waved under their nose! Raid the pound shop and do a lucky dip! Similar to the Goody bag idea above, but with extra thrifty bragging rights! And finally…If you know you’ll be buying for a lot of friends next year, hit those sales! Just imagine how pleased you would have been this year if the majority of your gift buying was already done for you. Now…Focus in HARD on that feeling and use it as inspiration to scrape yourself out of your turkey-induced coma on Jan 1st and get some bargains put away for next year! That’s it! Let me know if you have any tips or tricks for buying en-masse at christ-mas… hm.